To summarize: I was definitely surprised to read books by two of my favorite authors (Chuck Palahniuk and Dave Eggers) that I felt just "Eh" about. On the upside though, I discovered a new-to-me author that I fell in love with: Haruki Murakami. Though I wasn't as smitten with After Dark as I was with Kafka on the Shore, they were both interesting reads. I look forward to reading more by him and by Jeffrey Eugenides. Shawn handed me Into Thin Air when I was between books; I wouldn't have picked it out on my own based on the premise, but what an enthralling read! It was also fun to re-read books from my bookshelf, Stargirl in particular because I originally read it as a teenager and I had a different understanding of it this time around. And of course, The Book of Lost Things is my absolute favorite and I loved reading it another time through. I want to read more by John Connolly but it's my understanding that the majority of his other books are a very different genre, unfortunately. 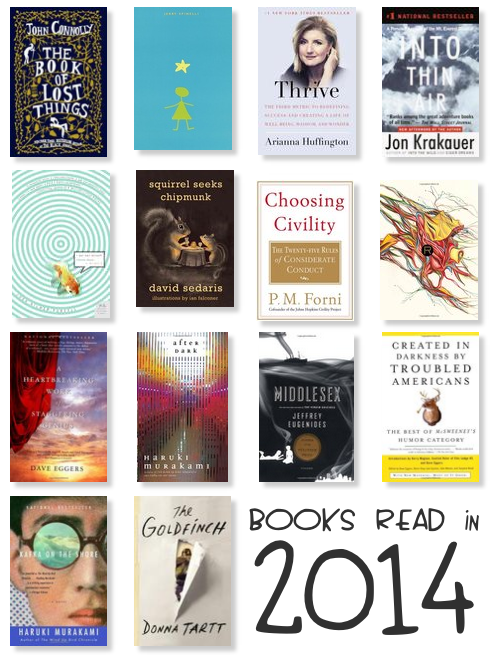 What did you read last year? Anything you'd recommend?